maetrics.co.uk | This template serves as a readymade format that you can use to create a job description of a sales and marketing manager. The best aspect of this PDF template is its user-friendly interface and easy to read font. 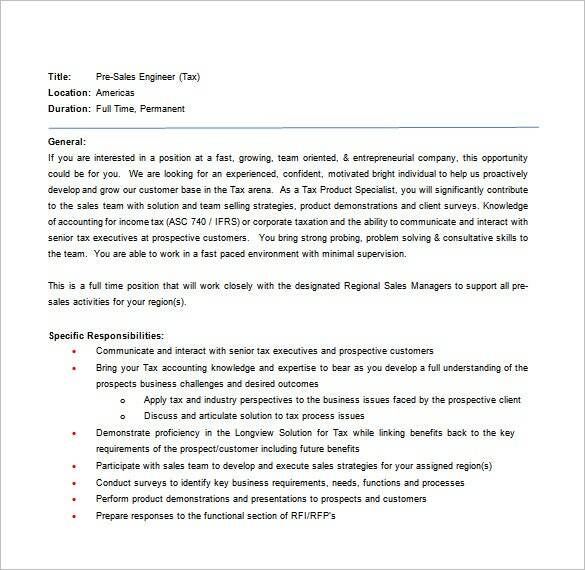 This template can be your ideal choice to create a detailed job description. 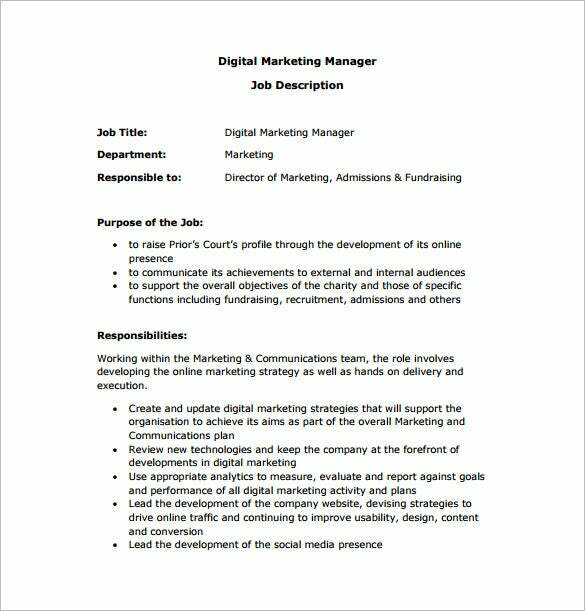 priorscourt.org.uk | This is a stylish and comprehensive template that can be used to create a job description document of a digital marketing manager. This template has a nice layout that can encourage your digital marketing manager to work as expected. This template is available for both professional as well as personal use. longview.com | This free to download Word template is a well-designed format that you can effectively use to create a job description document for a product marketing manager. Just download this template from here and it will give a detailed description of what a product marketing manager should and will do. This is a great template to be used for creating product marketing manager job descriptions. 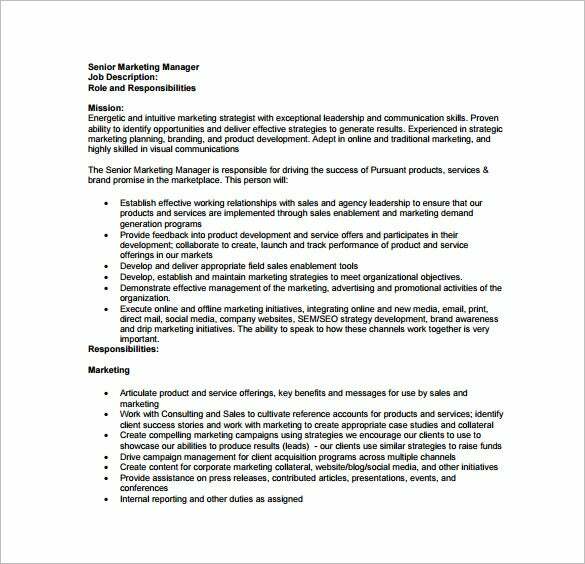 star-board-sup.com | Through this professionally designed assistant marketing manager job description template, you can put light on the job of an assistant marketing manager, and specify exactly what he is expected to do. 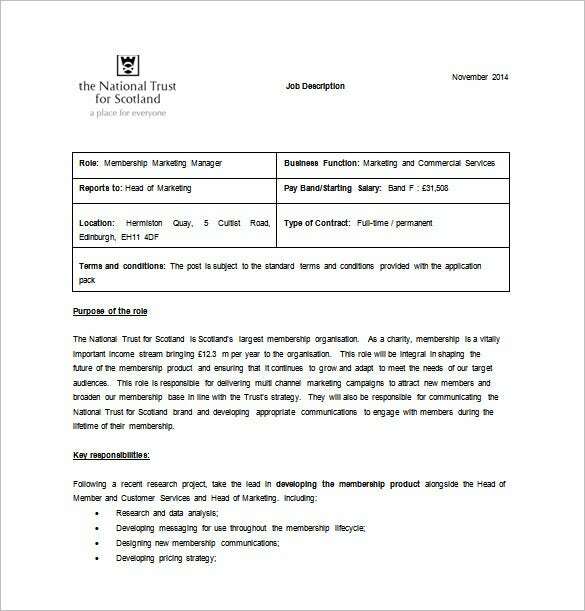 One may speculate what an assistant marketing manager is required to do. 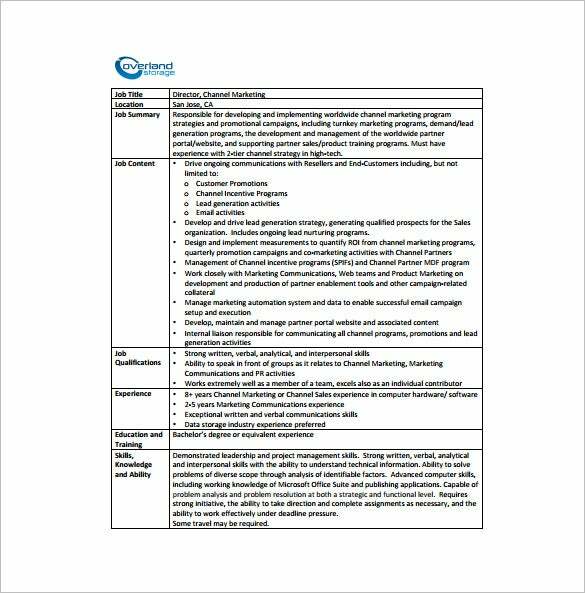 After seeing this job description template, you can make things clear for the assistant marketing manager as well as his senior. 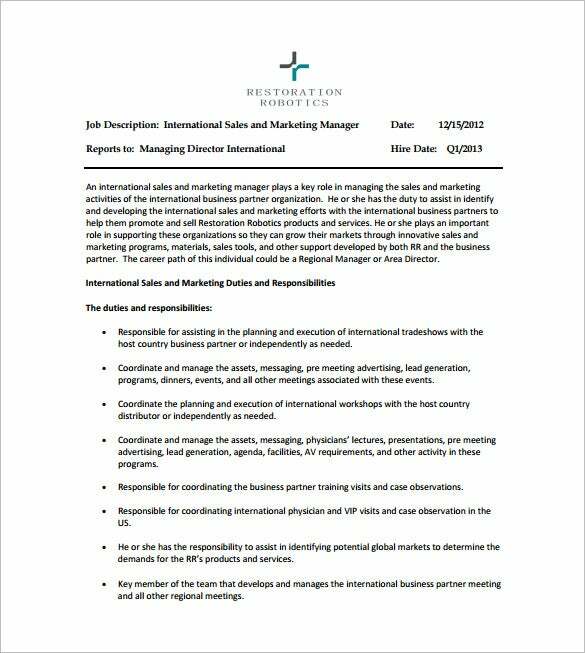 Why Do You Need a Marketing Manager Job Description Template? Marketing managers are instinctive, and know what to do to get their job done in the best possible manner. But a written document that mentions their duties can inspire them to work exactly as they are expected to do. When they know exactly what to do, they can focus more on their work and create a masterpiece marketing plan. 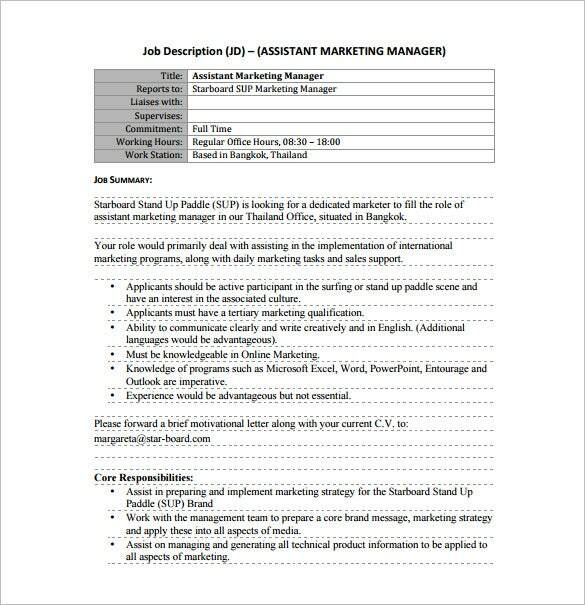 If you are a beginner, you can get help of these templates that mention your detailed duties as a marketing manager. You can have a look at the different types of marketing manager job description templates available here, and end up with a perfect template that best suits your job requirements. 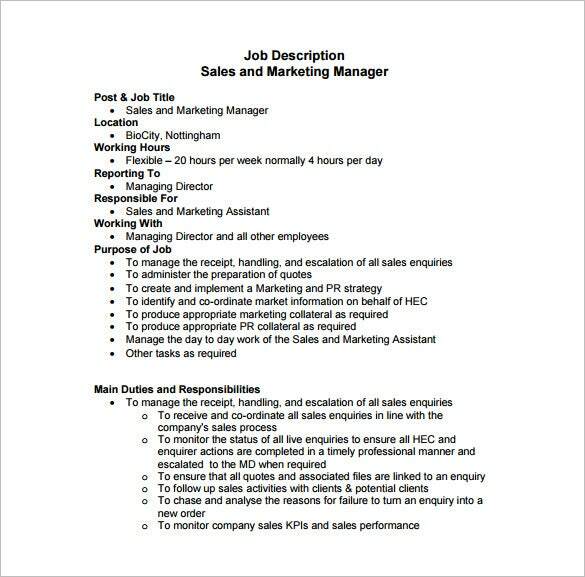 When Do You Need a Marketing Manager Job Description Template? Marketing managers have an important role to play for the success of a company. No matter how good the company’s product or service is, it will stay unnoticed if it does not receive proper marketing. 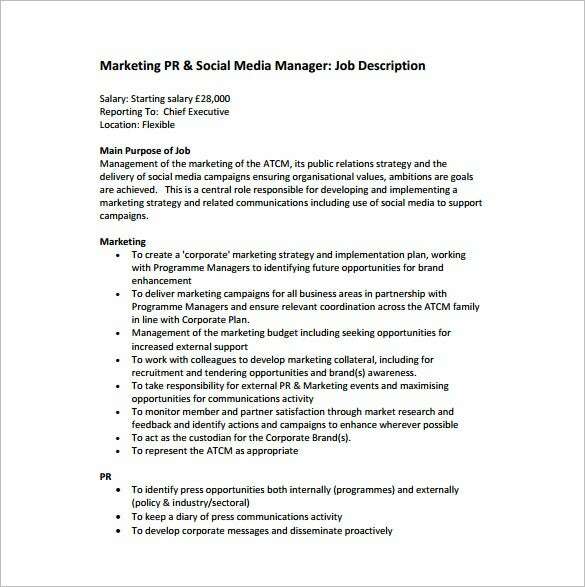 So, you need a marketing manager job description template right at the time of hiring one. By doing this, you can be sure that your marketing manager knows what to do and what you expect from him. 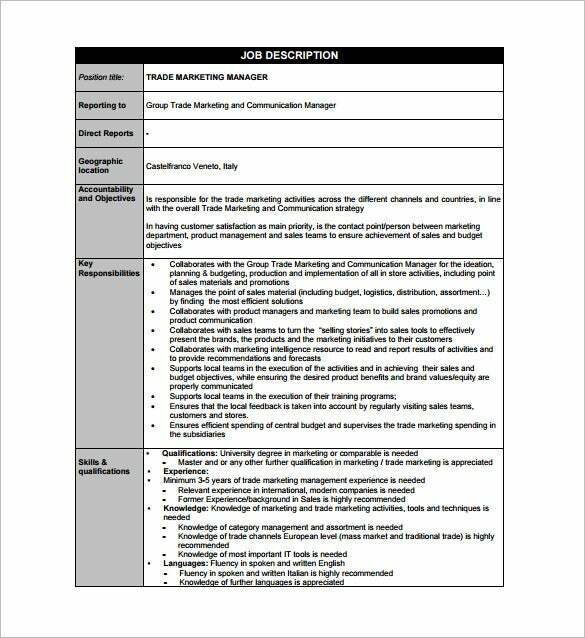 The marketing manager job description templates available here are designed by keeping in mind the works of highly successful marketing managers out there. They save your time, as they serve as readymade formats that you can quickly fill up and modify to create a job description for your marketing manager. They are fully customizable which you can easily modify to match your marketing manager job requirements.